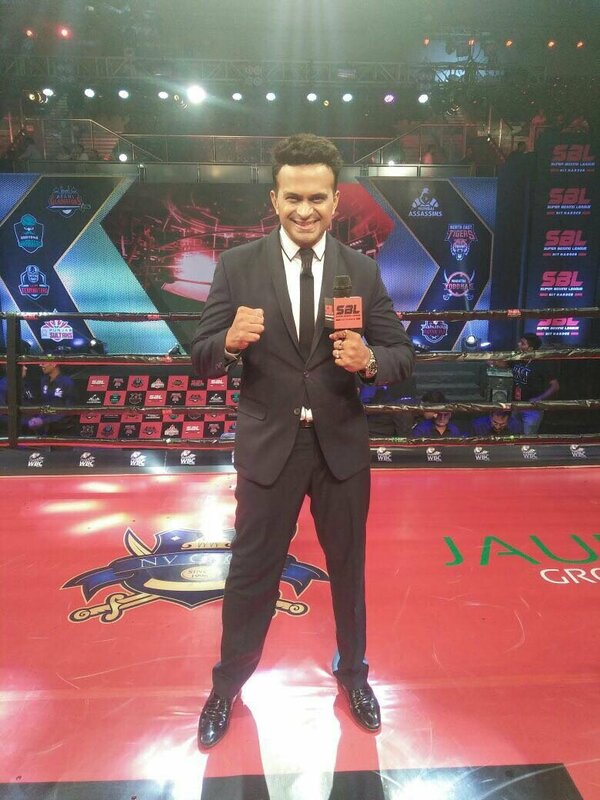 Siddharth Kannan is the Official Host of the ‘ Super Boxing League’ which airs every Friday,Saturdayand Sunday 7pm to 9:30pm on Sony ESPN and Sony ESPN HD. 8 team and 96 fighters from India and across the world are fighting to win the Title of SBL which is sanctioned by the World Boxing Council(WBC). 2 time World Boxing Champion and Olympic medalist Amir Khan,also the Chairman of SBL,says ‘Sid brings incredible energy and his Audience connect is truly outstanding!I would really like to have him host my fights across the globe!!!’. Bill Dosanj(Co-owner of SBL): ‘Sid K adds so much color to SBL..his ability to mix sports with entertainment makes him such an integral part of our league and an iconic host!’. Bob Yalen,World Boxing Council Supervisor, says: ‘Sid has fablous energy and really gets the crowd going..He is a pathbreaking host and SBL is lucky to have him’. The opening night had Sid throw a dare to Bollywood star Sushant Singh Rajput,the Delhi Owner, who accepted his challenge.Sid asked Sushant to do a ‘Krig Up’,which Sushant did with utmost passion and seeing Sid and Sushant’s chemistry the audiences went wild with thunderous applause. Sid K made Anil Kapoor and Arjun Kapoor do boxing bout in the ring and also made the girls Athiya Shetty and Ileana Dcruz have a fight..Guess What,Anil Kapoor did a knock out on Arjun Kapoor and the girls beat up Sid in the ring instead! Anil Kapoor : ‘Sid K made us have a ball..He truly knows the pulse of the viewers and he is the best host I have come across!’. Boxing is an individual sport, SBL is the only ‘team driven’ boxing league in the world. Here’s wishing that Siddharth Kannan punches his way to more glory and success! Previous articleRevealed- The First Look of ALTBalaji’s Bose-Dead/Alive starring Rajkummar Rao in and as Subhash Chandra Bose!